Gov Willie Obiano has declared his government's readiness to commence the third phase of the N20m community-choose-your- project initiative. The Governor declared this yesterday, January 31, 2019 at a retreat organized by the state government for Ndi Igwe and Presidents General of the 177 communities in Anambra State at the Prof. Dora Akunyili Centre, Awka. Speaking at the retreat, the Governor, ably represented by his Chief of Staff, Primus Odili, expressed great satisfaction over the effective, diligent and transparent manner employed in the execution of the first and second phases of the project. He lauded the efforts of Ndi Igwe and Presidents General who dedicatedly supervised the execution of the projects in their communities and assured that the third phase shall commence in earnest. The Governor also noted that the economy of the state had improved steadily over the past five years as a result of the direct investments into the economy via the community projects alongside other progressive economic advancements. "Our state is the safest state in Nigeria. We also have the fourth largest economy in the country. We have continued to attract foreign and local investors because of the secure and enabling environment created by government". "The third phase of the community project initiative is aimed at bringing development closer to the people. The initiative will help to create direct and indirect job opportunities for Ndi Anambra and engage our youths positively. It is our commitment to continue the development strides of this government and leave legacy projects for Ndi Anambra at the end of our tenure." The governor also seized the opportunity to clear the air on the impasse between the state government and the leadership of Ohaneze Ndi Igbo. He stated clearly that issues arose from Ohaneze's failure to honour the Owelle of Onitsha and foremost nationalist, late Dr Nnamdi Azikiwe, during President Buhari's visit to inaugurate a Mausoleum built in Zik's honour. 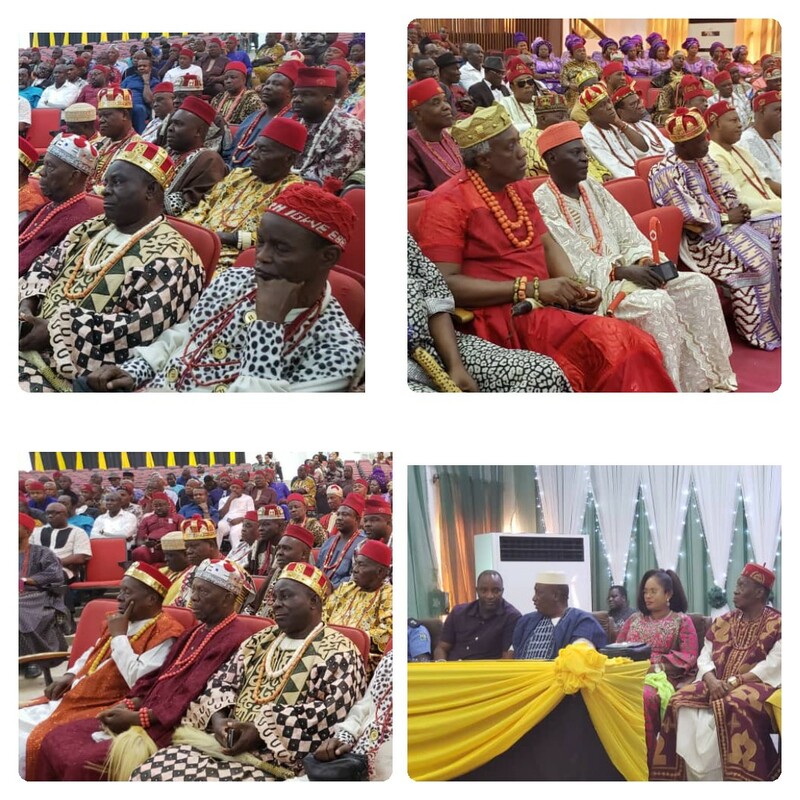 "Ohaneze opted to endorse a candidate for the coming elections in a hurried and poorly constituted meeting of the Imeobi on a day when the nation gathered to honour the great Zik of Africa. "In doing so, Ohaneze leadership rejected counsel and negated earlier agreement for the Igbo Apex Group to be non partisan and neutral", Obiano concluded. Responding, the traditional ruler of Awka, HRM, Igwe Gibson Nwosu thanked the governor for his visionary leadership and economic advancements in the state. He pledged the support of all traditional institutions in maintaining peace and security in the state. Igwe Nwosu prayed for the peace of the state and country and pledged the commitment of Ndi Igwe in seeking for a peaceful resolution to the impasse. In his remarks, Anambra State Commissioner of Police, Garba Umar, represented by CSP Odion Ekeinde, affirmed the command's commitment to maintaining security and safety in the state. He commended government's effort in supporting security agencies in the state especially in the area of community policing. "The effective collaboration between the state and local governments, and the traditional institutions has aided the police in fighting crime in the state. The community vigilante groups, in particular, have assisted in no little measure to ensure effective security and safety of life and property". Speaking further on security, the State Director of the Department of Secret Service, Mr Yusuf, observed that government had partnered with security agencies to evolve strategies which helped to effectively contain herdsmen/farmer clashes. He regretted however that cultism and drug abuse had constituted a fresh security challenge in the state. "The issue of cultism and drug abuse is prevalent among the youths and it is fast becoming a major security challenge in the state. "I want to plead with the Royal Fathers and Presidents General to intensify efforts in enlightening youths about the dangers of drug abuse. They should also be informed that the Governor has mandated security agencies to eradicate cultism from the state forthwith". The President General of Nteje community in Oyi Local Government Area, Chief Benneth Udeji Chinweze commended the efforts of the police and other security agencies in fighting crime in the state. He however stressed the need to close existing communication gaps and called for more collaboration between the locals and the security agencies. Supporting his view, the President General of Ogidi, Chief Chukwuka Jideofor Onubogu urged the police to partner the traditional institutions in crime fighting and prevention. He decried the incidences of indiscriminate and unlawful arrest of citizens and advocated for proper investigations and lawful arrests. The traditional ruler of Uke community and a consultant to the state government on community projects, Igwe Charles Agbala presented a compilation of the projects, started and completed through the first and second phases of the N20m choose- your- project initiative. The presentation displayed community halls, hospitals, markets, drainage, culverts, water projects and many more. The Commissioner for Local Government and Chieftancy Matters, Chief Greg Obi thanked Governor Willie Obiano for this laudable and visionary initiative. He stated that the government would have injected over N10bn into the local economy with this third phase of the excercise. He commended the traditional rulers and the Presidents General for supporting government's initiatives.